I've gone to Walden Pond a number of times over the years and every time I've gone, I've been reminded about Thoreau's book that I still hadn't read. 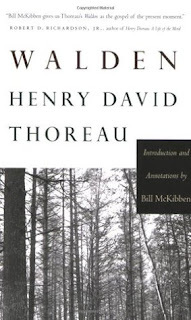 Thanks to the TBR Pile Challenge, I finally made it a priority to read Thoreau's musings on nature and his time living in a little cabin that he built himself out in the woods. Somehow I expected it to be a detailed account of his life while he was living near Walden Pond, and I thought that he wrote it while he was there. But it's more like he's looking back on the experience, and though it contains some details about how he lived it's mostly filled with essays in which he meditates on various aspects of life and nature. I have a lot of conflicting feelings about this book. It contains some of the most beautiful nature writing I've seen, but it's also really slow going and kind of boring in parts. I also found him difficult to like based on many of the views he expressed. Thoreau clearly has a sense of superiority over other people, and it is not deserved. One could argue that there are certain ways of living that may be objectivity better than others, but cutting oneself off from the world and criticizing those who don't is not one of them. It may be tempting to run away from the more social parts of life, but doing so doesn't make you better than other people. His essays display a love of nature, sure, but it's more of a dislike for being a part of society. He looks down on people who read the news, which he considers gossip. I don't really pay attention to news either, but it's not a bad thing to know what's going on in the world or your local community. Although he speaks of sucking all the marrow out of life, he eschews travel or any sort of activity that is new or different in favor of just sitting on his front step for four hours at a time. I'm just going to come out and say it: This guy is lazy. He does not want to work. He ridicules people who have jobs. He even says, "He that does not eat need not work." I think part of his keeping his activity levels low is so that he won't have to eat that much, and therefore not have to work for it (either through a job or through hunting/farming, etc.) Well, you may as well lay down and die if you're just going to sit around all the time to conserve energy. At the same time, we could all do well to spend a little time observing the natural world as he does. He may spend a little too much time describing the ice on the pond, but his account of ants fighting was both educational and amusing. He made his surroundings come alive in his descriptions: "All day the sun has shown on the surface of some savage swamp, where the single spruce stands hung with usnea lichens, and small hawks circulate above, and the chickadee lists amid the evergreens, and the partridge and rabbit skulk beneath..." There were many such passages I re-read just to savor the poetic language. At times it was a bit of a slog, but it was nicely balanced with vibrant, lively discussions and observations so I'm glad I finally got around to reading it even if it wasn't the easiest book to get through. If you are thinking of reading it, I recommend the way I read most of it: in summer, while sitting outside.